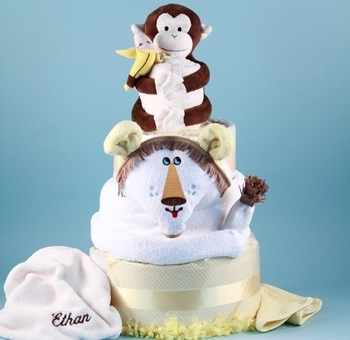 Our adorable baby diaper cakes are a terrific gift idea for baby showers and new baby gifts. Our adept designers use their artistry and creativity to fashion diapers into innovative shapes and designs that are fun, fabulous, and useful. Select from many sizes, colors, and themes for girls and boys. We even have unisex versions for parents who prefer to keep the baby's gender a secret. Please let us know if you need help with your shopping or if you have any questions by sending an email through our contact page or by phone at 866-476-0213. Every diaper cake shown here is guaranteed and, as always, includes free shipping within the Continental U.S.